Mary Jane Blackketter was born on the family farm in Roger Mills County Oklahoma to Roy D. and Lena (Shockey) Blackketter on February 13, 1944. 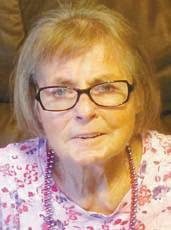 She passed this life on August 11, 2016 at the age of 72 years at Elk City, Oklahoma. Mary loved living on the farm doing chores, helping her parents, and attending Leedey Schools. She lived on the farm until her parents passed when she then bought her little house in town. Thereafter, she enjoyed working funeral dinners and helping with Vacation Bible School – at every church in town. Her favorite past times were crafting, baking pies, and spending time with her family. Mary Jane was preceded in death by her parents, two brothers, one sister, and by her nephew Joe Blackketter. She is survived by two brothers, Lee and his wife Donita of Leedey and Roy and his wife Ladonna of Clinton. Her nieces and nephews Cris, Levi, Sherrie, Bub, Chase, Raegan, and many others too numerous to mention. In lieu of flowers memorials can be made to Oklahoma Baptist Children’s Homes, Red Star Church, or to the Leedey Ambulance in care of Shaw Funeral Home.